Replies: 163 (Who? ), Viewed: 70902 times. I have a thread on the titanic on here, links here. 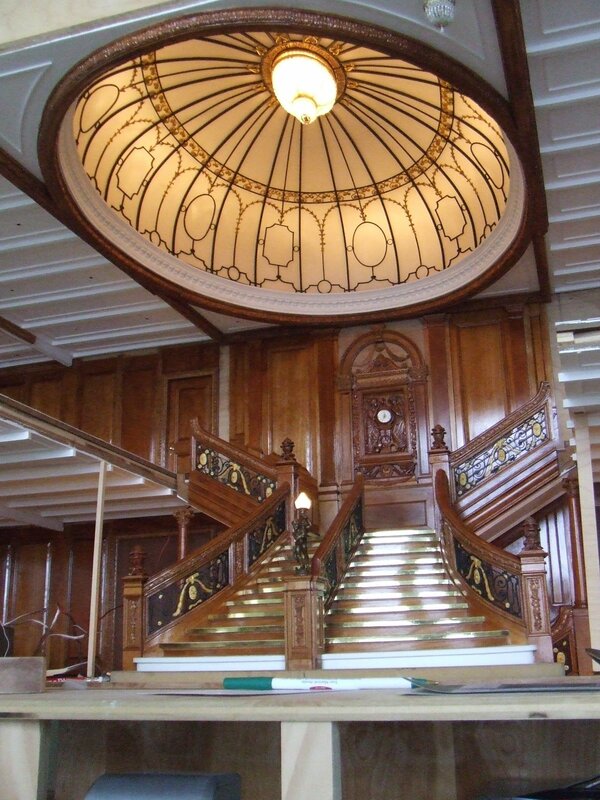 And for the grand staircase the dome I found, the only dome I found wasn't big enough or was satisfying enough for me. I want to create a dome from scratch, or maybe I can co-create it with a mesher on here. I can work on the texture, as I'm about 3/4 done the black and write design using PS. I'm trying to duplicate it from the actual ship, attached is the sample. Is there any tips or any help that could help me build it, I want the dome to be as big as 8x8, and not as high as a ceiling. Last edited by zelda101 : 2nd Jun 2012 at 11:18 PM. so 8x8 and 3 tiles up? If you would mesh the dome you would only mesh one segment but uvmap the 3 designs. Then its just a matter of copying and rotating the segments. Probably a bit diffrent then you had in mind? I'm not sure what you mean by three tiles up? 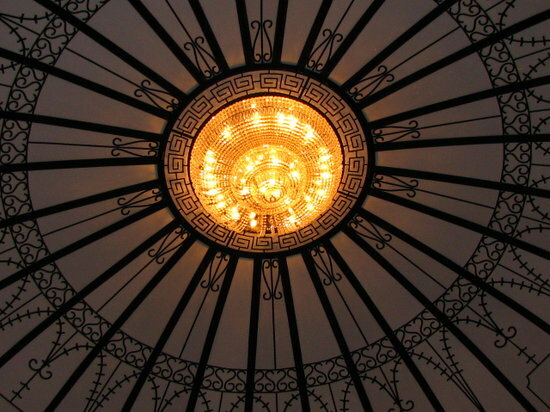 Also would it be possible to make an floor-tile ceiling attached to the dome, as you can't cut out the floor without it looking like an octagon. (The dome is rounded into a circle). Last edited by maxonick : 30th May 2012 at 10:12 AM. 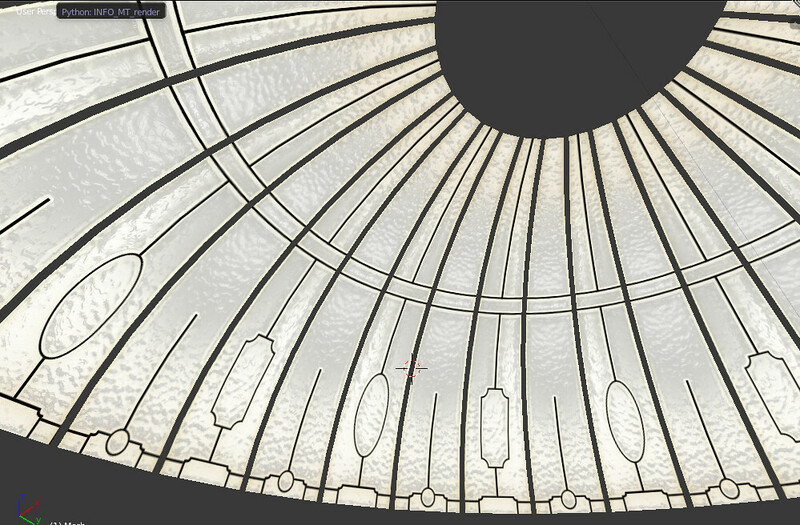 The dome mesh is not the hard part(i made one yesterday) but the uvmapping and the texturing is. 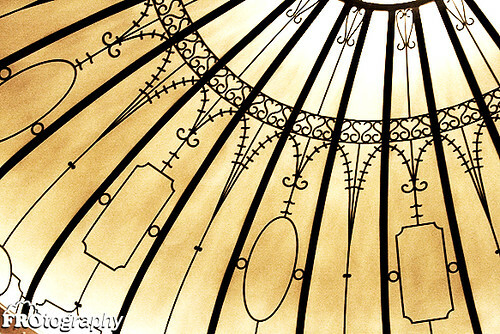 The dome has 32 segments, all are the same except for the glass(if it is glass?) wich has 3 diffrent designs on it. So i made one segment, one glass part with one iron barr next to it. I am going to uvmap it properly today and when done i duplicate that meshpart and rotate it 11.25 degrees. the glass on the duplicate needs a diffrent design so i need to remap(or move cos i have it already) that part on the uvmap. I repeat the first steps for the 3rd design, when done i have 3 segments with the glass uvcoordinates on 3 diffrent spots on the uvmap. Then im pretty much done, all i have to do now id duplicate the 3 and rotate them again, and again. The hardest part will be the texturing and there is not much info to find. So you best create one from scratch, all 3 designs. Instead of 8x8 i made it 16x16, so the screenshot shows wrong proportions. This is how it shouldbe made, look at its texture setup bot dont start creating yet cos i prolly redo it. Last edited by BloomsBase : 8th Jun 2012 at 8:02 AM. You can ask us there, but most of creators there including myself don't know how to convert it. If it has both mesh and textures youi might be able to convert it. a quick photoshop texturing....... but with this detail you best handdraw the texture. It's greater than I expected. If you want I can try at texturing the image. I created the smaller one attached earlier. When it comes to texturing, is it ever in black in white, or is a coloured image? Okay, but you need to ask the creator for his permission before you do so! You can ask him trough a private message. There are alot ways of texturing the parts, even make them recolorable ingame. I can give you the new template so you can start texturing altho it still believe its easier to do it by hand but have a go and see. With the template things are pretty straight forward. Do you have a 3d editor were you can view the mesh and it texture? PM me for the mesh if you have a 3d editor and want to view the results yourself. I have Blender, will that work? But thanks I will work right on it! Blender is good, do you know how to apply a texture? Last edited by BloomsBase : 31st May 2012 at 4:37 PM. Alright so far, this is how far I've gotten. And I already knew the basics of Blender so applying a texture wasn't all that hard for me. I still have to add a few more things, obviously. Just thought to let you know on my process. I'm going to round the lines going near the center to make it look more round. I have a question about the hole in the center, how big is that? And is there anyway to cover it? hehe, i have all the other parts here. the iron bars for in between, the round part and the iron bar wich goes between that. Still need to make the lamp and floor'. Ill try to sent you the rest tomorrow. Ill try to put a picture before i go to bed. The quarter panels arround it are also glass, they are not on your file. All wat is black is iron, no need to texture those parts. ITs only one floor high now, can you wait with the texturing till we agree about the size and such? Last edited by BloomsBase : 31st May 2012 at 3:25 AM. BloomBase, may I also have it? Here is a more updated progress, how does it look so far? Last edited by zelda101 : 31st May 2012 at 1:03 PM. Did you read my post Zelda? We need to agree bout the mesh first, it doesn's hav the correct proportions yet. I uploaded the obj file few posts back, abd the template is the last one. The pic Zelda is showing is not ingame but in Blender. The lamp is actually bigger, but the size of the dome isn't. I'm not really sure what you mean by scaling both sides towards each other? Is that what you meant by it not having the correct proportions yet? 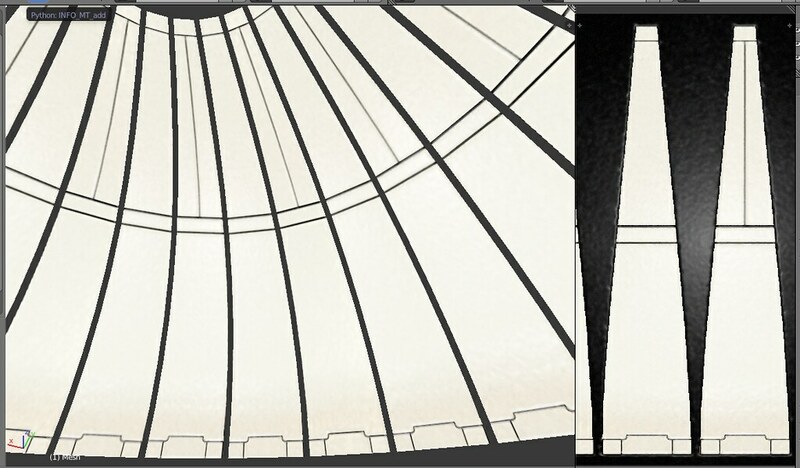 i only use pictures from the real dome, the deep see one is the real thing. When you look at it it is about 2 floors high instead of one. The picture you posted is a aftermarket one, little bit diffrent. I agree on the 8x8 but i think it is much higher? It is a bit high, should it stay at one floor high? So that way, any other ceiling lights can fit? This is going a bit off topic, but the deep sea thing is not from the Titanic, I'm talking about the second picture btw. The underwaterpicture i put up seems inaccurate as the real wreck no longer has the dome. Last edited by BloomsBase : 31st May 2012 at 3:44 PM.